What light is? What is Gravity? We know about the quanta live forms Pinky and Fanny. The smallest of all. So but for easier writing, we require a simple form. Also, we wanna know what Gamma γ radiation is or? Also, this is the reason for the number 3 ). Math is cool or? Air pair of Beta and Fanny is named DELTA Δ. So we know what Gamma γ is. In this Orbit are the two Sampi, Pinky, and Fanny together (Gamma γ) with a specific Φ Phi. The gravitation between the two Sampi is in this orbit. This is our smallest room. So let us do some mathematics and put this into a formula. We know that ℕ (general definition of our room) never could be zero because zero not exist. There is always a minimum of two quanta live forms in the room. This definition means that a minimum of 1 is always in a room (Orbit the smallest room). The next bigger “room” is an array of orbits in a gravitation wave. So we name this room ϒ – Upsilon. This letter has its origin in the Phoenician letter “wau” . In this wave is a specific gravity. It is the same like outer space, this is the reason for wind and so on. We defined this in a post before. Matter Μ is Light (Lambda λ). What is Love? Was ist Liebe? Wir haben die phönizische Schrift. Sie ist die Basis alles Weiteren. Technologie und das Wissen diese Werkzeuge einzusetzen diese einzusetzen und das ganze zu verstehen. We have the Phoenician letters. She is the base of all. The Phoenician bring the humans evolution. They are not from the earth. The Phoenicians have brought the humans tools for proceeding in evolution. But the humans are missing in knowledge and technology until today to use the tools for further processing in evolution and understand the whole thing. Wir haben das Volk der Ionier. Vielleicht ist es ein Mythos, vielleicht aber auch nicht. Ich werde versuchen, dass noch herauszubekommen. Ein Erklärung unserer Evolution ist, dass wir alle Geschwister sind was auf die Ioner zurückzuführen ist. We have the “Ionics”, maybe this is a myth, maybe not. I will try to find out if true or not. An explanation of our evolution is, that we all are brothers and sisters on the planet which have the origin in the ionic. kein Griechisch hatte. Wenn wir eine Buchstabensuppe aus allen machen kommen wir zu einer Lösung. The evidence in this is that when we show the source of the letters and the origin of them, we see that the base are no Greece. So if we make a soup of the letters we find a solution. weiterentwickelt ohne die genaue Bedeutung bis heute gekannt zu haben. There is also the mistake – some letters have been advances without the knowledge of the original meaning. Because we do not understand it until now. Danach wurde einfach die Mathematik erweitert mit einigen Symbolen und Theorien. Diese sind aber nicht logisch. The Greece build the basics of mathematics. Later the people just advanced the mathematics with symbols and theories. But they are not logic. Menschen suchen. Das ist die Basis von allen. To find the origin of some diseases, even Parkinson’s disease I have to dig deep and have to look for the protoplasm and the origin of the humans. That is the base of all. die Medizin bisher keine Lösung gefunden hat. A base of our nature laws has been interpreted wrong. That is not beautiful and an explanation for many dead ends for what the medicine has not found an explanation yet. Origin of all live forms are Quanta animals. Light is build from these quanta animals. Alpha ist Radioaktivität (dass wir so definiert haben). Radioaktivität ist Licht einer bestimmten Wellenhöhe. Alpha is radioactivity (what we defined so). Radioactivity is the light of a specific wave height. Doch wie definieren wir alles? But how we define all? Let’s get started. The base of Mathematics is built from the Greece. The base of Maths is only a few letters which still exist today. The letters of the Phoenicians and of other nations are only partially known now. The source of light are elements, the littles of the animals. The quanta animals. alten Griechischen Alphabet lassen sich Buchstaben herumdrehen oder auch nicht. A letter of the Greece Alphabet is Sampi. In the old Greece Alphabet letters, could be turned around or not. Some typos are written from right to the left and turned overwritten. Sampi ist so einer. Sampi is such one. konnten nach dem Sie fast alle von den Ionern umgebracht haben. We see this in the development of the ionic alphabet. Such named “Neutros” has been taken from the Greece. Problem was, that the ionic nation was too kindle and the humans just hunted them. This is the reason, that we do not know the meaning of this because they have no one to ask about that. Because they killed almost all of them. Wenn wir Sampi Spiegeln haben bekommen wir den Buchstaben Sampit . Es gibt bis jetzt keinen bekannten Name für diesen Buchstaben, so nenne ich es einfach Sampit. If we mirror the Sampi, we get the letter Sampit. There is no name yet for this known, so I just named it Sampit. We have a specified amount of these live forms in the Universe. Fanny hat die Wertigkeit ++. Fanny Quantentierchen haben die doppelte Kraft wie Pinky Tierchen. Die Quantentierchen fliegen überall herum, im All, auf der Erde, überall. „Das Plus“ geht auf das Phönizische „Tau“ zurück welches aussieht wie ein großes +. Was macht ein Tau? Es wird genutzt um etwas festzumachen. Fanny has the valency of ++. Fanny quanta animals have the double power like Pinky animals. The quanta animals fly all over around, in the outer space, on the earth, overall. “The plus” have as a source the Phoenician “Tau”, which looks like a big +. What does a Tau do? It is used to fix something. der alten Griechen gab es kein Minus, sondern nur Plus. The quanta animal on the right – Pinky has always only a valency of 1, but also consists on Alfa. In the origin mathematics of the old Greece, there was no minus, only plus. ist der erste Buchstabe des alten Alphabets der Phönizier. Die Griechen machten daraus Alpha. is the first letter of the old alphabet of the Phoenicians. The Greece made from this Alpha. Alfa/?ALF entspricht dem Zahlenwert 1. Alfa/?Alf match the value 1.
we conclude, that the left (Fanny) have the stronger attractness and wanna always Pinky. It is dominating in this case. Pinky hat keine Chance, wird angezogen und klebt an Fanny. Überall schwirrt deswegen noch Alfa herum, das den Ausgleich zwischen den beiden Lebensformen bringt und die beiden auf einen richtigen Level hält. Pinky has no chance, is attracted and adhered on Fanny. Everywhere, Alfa is still buzzing around, balancing the balance between the two live forms and keeps the two on a correct level. Alfa hat auch den Wert 1 (+). Alfa also has the value of 1 (+). Die beiden Tierchen kleben aneinander sind aber Neutral sofern der Ausgleich der Macht gegeben ist. Both of the two animals stick together but are neutral if the balance of power is given. Bēt ist aus dem Phönizischen. Später wurde aus diesem der hebräische Buchstabe Beta β.
Bēt is Phoenician. Later this converted to the Hebraic letter Beta β. So was sagt uns das? So, what does this tell us? Beth (hebräisch) oder Bēt von den Phöniziern hat die Wertigkeit „Zwei“. Also Zwei Dinge einer Sache. Sieht man ja oben an der Formel. Beth (Hebrew) or Bēt from the Phoenicians have the value of “two”. So, two things of a subject. We see this in the formula above. Die Tora beginnt mit der Zahl zwei. The Tora starts with number two. Wir haben eine bestimmte Anziehungskraft der beiden die sich mit Ny – (griechisch) definiert, mit Ursprung aus dem phönizischen Alphabet nūn . We have a defined attraction of the two, which is defined by Ny – (Greek), originating from the Phoenician letter nūn. Das ist die Menge der Quantenteilchen, welche sich in einem Raum gleichzeitig befinden (N). This is a specified amount of the quanta live forms at the same time in a room (ℕ). Wir wissen, dass diese Tierchen eine bestimmte Wertigkeit haben, also wie viele von diesen Tierchen sich in einem Raum befinden. We know, that these live forms have a specific valency, how much of these live forms are in a room (ℕ). Die Tierchen konkurrieren untereinander was letztlich entscheidet wie viele sich hiervon sich in einem Raum befinden (ℕ). We know, that these little creatures have a specified valency; how much of them are in a room (ℕ). So wie drücken wir das nun mathematisch aus? So how we definie we this in mathematics? Ein vorangestelltes Doppelkreuz beschreibt in der originalen Griechischen Mathematik die „Mächtigkeit“. A double cross before a letter describes in the original Greece mathematics the “Power”. Das können wir auf die beiden Tierchen Fanny und Pinky übertragen. Solange ein ausreichendes Gleichgewicht gegeben ist passt es und Alfa ist gebunden. Das Konkurrieren der beiden Tierchen aber auch Mengen von Tierchen (in einem Raum) um die größere Macht wird mit dem Goldenen Schnitt bezeichnet. We can transfer the properties of the two animals to Fanny and Pinky. As long a sufficient balance between the two live forms is given, it fits and Alfa is bound. The competing of the two live forms, but also a specified amount of these animals (in a room), try even harder (thank you Hertz), to gain a greater power which is also called the Golden Cut (thank you for inspiration to my post co-worker). Also wer von Fanny oder Pinky hat die größere Macht? Der Goldene Schnitt in der Mathematik wird mit dem großen Buchstabe Phi definiert. So, whom of Fanny and Pinky has the greater power? The golden cut in mathematics is defined by the big letter Phi Φ.
Eine Definition von beiden kann auch Gut und Böse lauten, wir können, dass einfach übertragen auf die griechischen Buchstaben. A Definition of both could be also the bad or just simply love, or the north and south, hell or heaven. We see this in the original meaning of the Greek letters. The Greece letter Psi is the 23 th of the Greece alphabet. We also could say North and South, the bad white and the good black. Depending on how the balance between the different amounts of both live forms are defined. Der Griechische Buchstabe Psi ist der 23. Buchstabe des griechischen Alphabets. Wir können auch Sagen, Nord und Süd, die bösen weißen und die guten Schwarzen. Je nachdem wie der Ausgleich der beiden Mengen von Tierchen definiert ist. How good the harmony between both live forms is, is at least a reason for the golden cut – “Phi”. Wie gut die beiden Tierchen harmonieren ist, letztlich Ursächlich für den goldenen Schnitt – also „Phi“. ℕ is endless because the borders of our room also have an end. ℕ ist endlich da auch die Grenzen unseres Raumes endlich sind. ℕ kann niemals leer sein -> die Null (0) existiert nicht. ℕ could never be empty -> the zero (0) does not exist. ℕ for the room of natural numbers.ℕ für den Raum der natürlichen Zahlen. Thank you to the one, which I do not remember about yet. :). Thank you to all other who listened to my ideas and inspired me. Thank you to Holger. So I calculated something around and found a solution…it is not finished yet…like the universe is a calculation really hard to face. But it is simply normally – there is something wrong in our environment. So, ich habe etwas herum gerechnet und eine Lösung gefunden…es ist jetzt noch nicht fertig…wie dass Universum ist eine Rechnung wirklich schwer zu finden. I have found a solution for Gravity, Energy on Earth and the movement of Energy. We have an Element 5. We know now what the wind is. What the sun does, what live forms are build from – light – what the earth is and why the waves 🌊 are the waves. The natural laws stand on the head now. We are all built from light. Teleporting is possible. Quantaphysics is not completed. We have two elements. Quanta fanny animalcules (X) and LAMBDA (Sun). Let us put all things together. And make it better. I give you a solution. There is always a solution. Nothing is impossible. E = m * c² or -> the equivalent of mass and energy or short E = mc². This is wrong. Formula 1-1+1-0: Rotation of the sun system and our sun system. 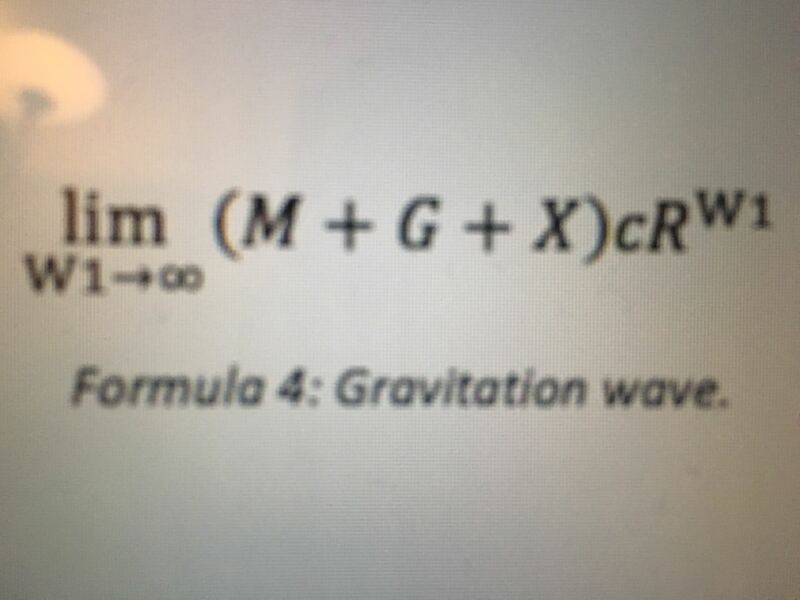 G = Gravity is light with a defined wavelength and speed of the particles. 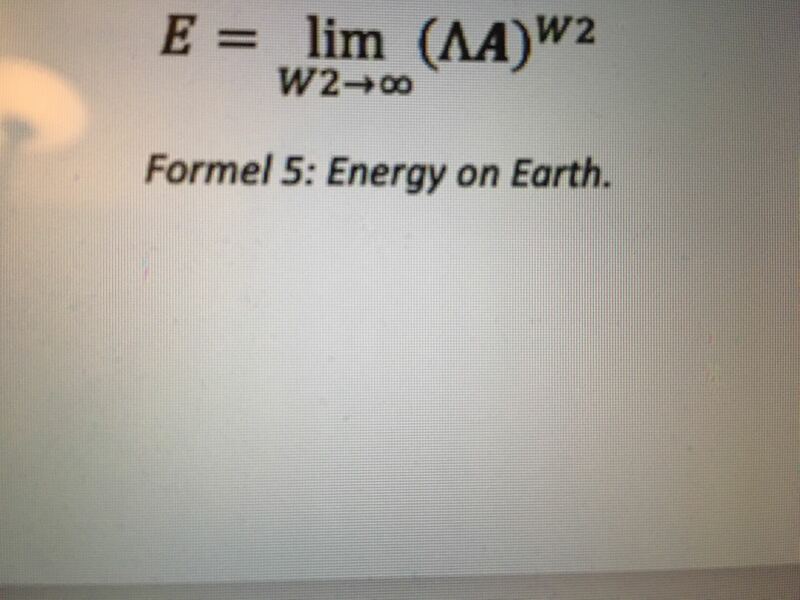 Formel 5: Energy on Earth. Formel 6: Energy movement through gravitation wave movement on earth. In memorial of Alfred Nobel, died on 10th, December 1896.